Matchbox Cineclub, enjoying some disreputable trash. Matchbox Cineclub‘s September screening was Nobuhiko Ôbayashi’s House (1977). 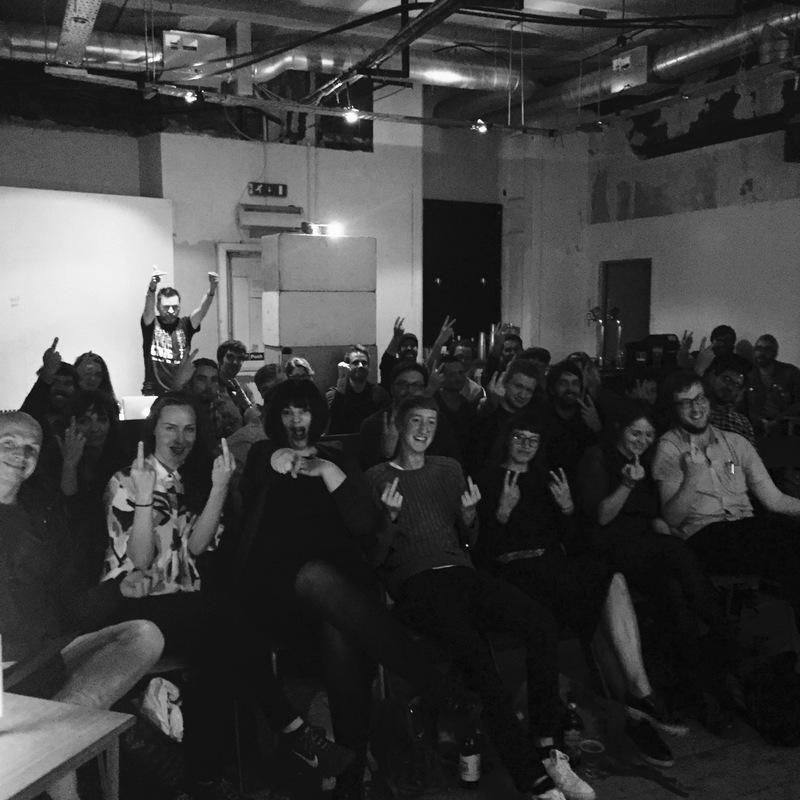 It was part of the annual UK-wide Scalarama film festival which aims to celebrate independent cinema and DIY, pop-up cinema culture, often with a focus on what The Skinny called “the kind of disreputable trash the Scala specialised in”. We thought we’d take the opportunity to give everyone a little look behind the scenes of Matchbox Cineclub as we set up in our host venue, The Old Hairdressers. Matchbox Cineclub’s July screening and the debut of our monthly residency at CCA is a very rare, 35mm outing for Long Shot (Maurice Hatton, 1978), followed by a Q&A discussion of the state of Scottish filmmaking with some special invited guests. The screening takes place at 7pm on Thursday 21st July. Matchbox’s residency continues on the third Thursday of every month at CCA. Filmed and set at Edinburgh International Film Festival, 1977, Long Shot is a deadpan satire about the trials and tribulations of British independent filmmaking, with terrific cameos from Wim Wenders, Susannah York, Stephen Frears, Alan Bennett and John Boorman. A budding Scottish film producer (Charles Gormley) tries to get his ambitious Aberdeen-set western financed, and while he attracts some major stars and directors to the film he finds that with their support come more and more script changes. This screening is by arrangement with Mithras Films. Matchbox are screening the long out-of-circulation Long Shot from a 35mm print straight from the BFI Archives. Tickets are £4 + £1 booking fee from CCA’s box office, online, in person or by phone, 0141 352 4900. Here’s the trailer for our upcoming screening of Forbidden Zone (Richard Elfman, 1980). The screening is by arrangement with Arrow Video. Seating is limited, tickets are on sale now. Keep up-to-date at the Facebook event page here. Valpuri Karinen designed the poster for our upcoming screening of Forbidden Zone (Richard Elfman, 1980). 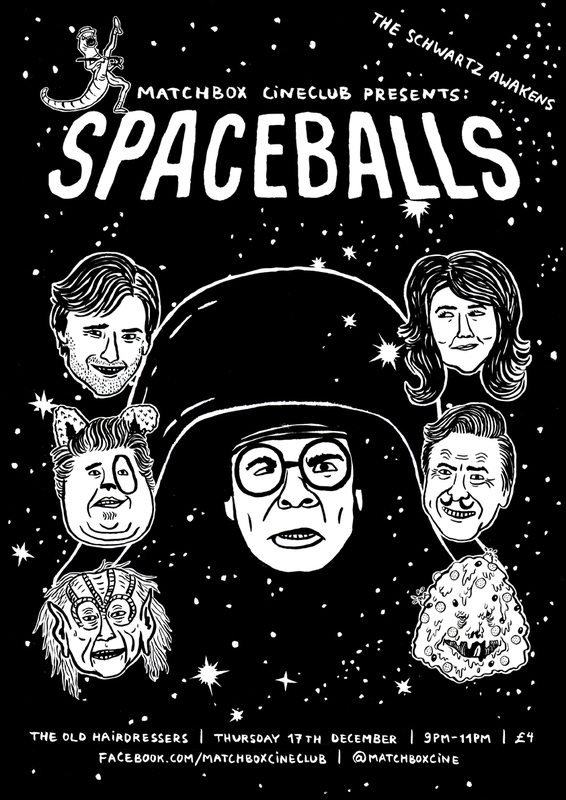 Valpuri also made Matchbox’s Spaceballs poster, and you can check out more of her work at her website, here, or at her Tumblr, here. Our Forbidden Zone screening is by arrangement with Arrow Video. Seating is limited, tickets are on sale now. Keep up-to-date at the Facebook event page here. This month, Matchbox Cineclub is taking part in The Old Hairdressers’ FANTOM CINEMA programme, which runs from Friday 8th April to Sunday 24th April. We’re presenting a very special MYSTERY MOVIE. For the next few weeks, we’ll be offering up some clues, but the specially selected film – which you will not see screened anywhere else – will only be revealed to attendees on the evening of Thursday 21/04. The Fantom Cinema programme sees the Old Hairdressers’ gallery space turned into a temporary cinema. The expansive programme has been selected and developed through an interest in hauntology, the fringes of sci-fi and a curiosity about the potency of the lucid space of cinema in relation to action beyond the edges of the screen. It draws on the connections that can be made between artists’ lives, the complexities of labour and the stories that surround individual practices. It hopes to conjure up the ghosts that haunt previous manifestations of this exhibition space and explores how changing the format that frames activity can enable new readings of ongoing practices. Entry is FREE, with an optional donation. Keep up-to-date at the Facebook event page here. Check out the full Fantom Cinema programme here.